Oh great… another sci-fi build. We’re so bad at these. OK, this large space 8×8 truck comes from the mind of Andrew Somers, and it looks the perfect mobile laboratory for some scientific planetary exploration. Twin axle steering allows the truck to turn tightly and a large crane and grab mechanism allows samples to be gathered from inside the truck if it’s looking a bit dicey outside. Probably anyway, we’ve literally made all that up. Whatever, there’s more to see at Andrew photostream at the link above – click his name to make the jump. Today is the inauguration of the 45th President of the United States of America, and here at The Lego Car Blog we’re commemorating this milestone event with something old, dangerous, and orange. Built to scare the Soviets in the late 1950s this is a MM1 Teracruzer eight-wheel-drive missile carrier, complete with a Martin Mace nuclear missile, and despite its murderous (and completely futile) purpose, it’s a magnificent looking thing. It’s as if Thunderbirds were run by a maniacal doom-monger. This neat Scania dump truck was discovered on Eurobricks today, and at first we thought it was a simple, although good-looking, mechanical model. However the exterior is deceptively bland, as it’s hiding some proper engineering genius underneath. 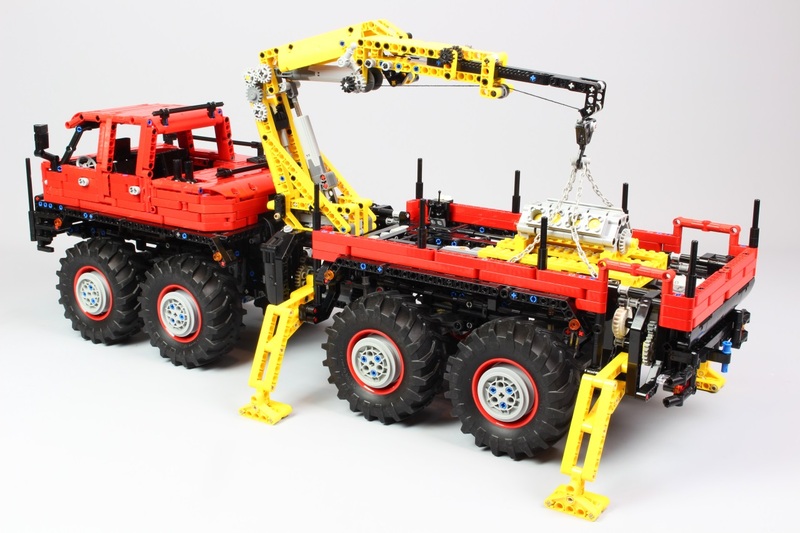 Builder TomasHubik has managed to squeeze in a fully remote controlled 8-wheel-drive, 4-wheel-steering chassis, complete with a differential between each pair of wheels and different turning radiuses between the first and second steering axles. Not only that, a Power Functions Medium motor allows the load bed to raise and lower too. We’re as baffled by how all that fits inside as we are by your Mom’s corset, so we’ve taken the unusual step of publishing a photo of the chassis in this post too. You can see more of Tomas’ build, including a larger version of the image below, at the Eurobricks discussion forum – click the link above to see if you can figure it out. As we’ve mentioned here, here, here, here and here, Communist state-run vehicle manufacturers were almost universally crap. Thankfully they’ve almost universally been consigned to history too, but there are two notable exceptions. The first is Lada, who – despite their notoriety for being crap – do probably have a bright future ahead of them. No longer controlled by the Russian state they’re now half owned by the Renault-Nissan Alliance, and that means they’ll start making quite good cars quite soon (yes really! We’ve been right before…). The second exception is the maker of the grey beast pictured here, KamAZ. Founded in 1976 by the Soviet Government (as was everything in the Soviet Union at the time), KamAZ have gone on to become an unlikely success story. To date KamAZ have built well over 2million heavy duty trucks, with 43,000 rolling off their production lines each year. Unlike other examples of ‘successful’ Soviet vehicles (where the vast numbers sold were because consumers had no other choice), KamAZ trucks are successful in the competitive open market, are world renowned for their toughness, and have won the legendary Dakar Rally a record thirteen times – winning every single stage of the event last year. Still half owned by the Russian state (whose military rely on their products), KamAZ are now part owned by Daimler AG – better known as Mercedes-Benz – and turn over $3billion a year. Some of that success is down to this, the ultra heavy duty (but rubbishly named) KamAZ 63501 8×8 truck. This stellar Lego example of the 63501 is the work of VovaRychkov, and he’s recreated the Russian titan beautifully. There’s lots more to see at Vova’s photostream – click the link above to take a closer look. Nope, us neither – but apparently the Avtoros Wamah Shaman 8×8 is a Russian amphibious all-terrain vehicle presumably designed to get teams of engineers to remote pipelines and suchlike, but which will probably end up with diamante paint-job parked outside an exclusive Moscow nightclub. Which is a shame, as the Shaman is quite a vehicle; able to climb 45 degrees, crab steer, and propel itself across open water. 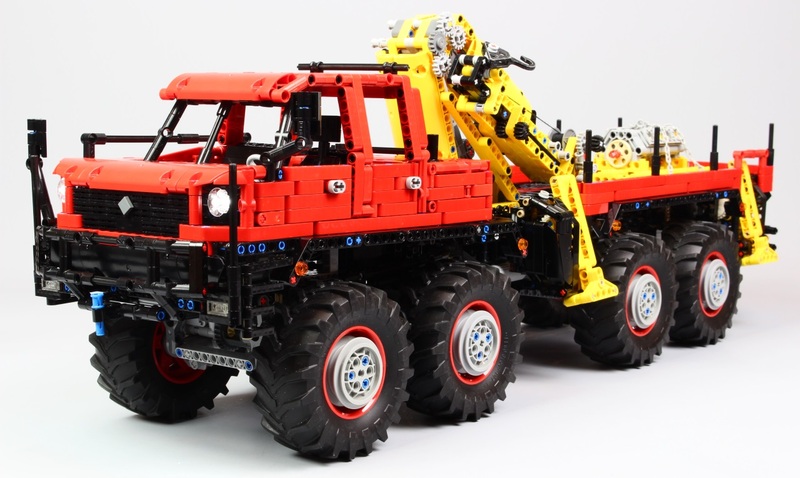 This incredible Technic recreation of the Russian ATV is the work of previous bloggee Madoca 1977, and it can do most of that lot too. With each axle powered by a separate L motor and two servo motors for steering, Madoca’s Shaman has both 8-wheel drive and 8-wheel steering. Just like the real vehicle it’s able to crab steer too, which is remotely selectable by a M motor. Another M motor powers the winch, there’s 3 sets of LEDs, all-wheel independent suspension, and opening doors, hood and roof hatch. Power is provided by twin on-board rechargeable batteries and is distributed to the eight Power Functions motors by two third-party SBrick bluetooth controllers. 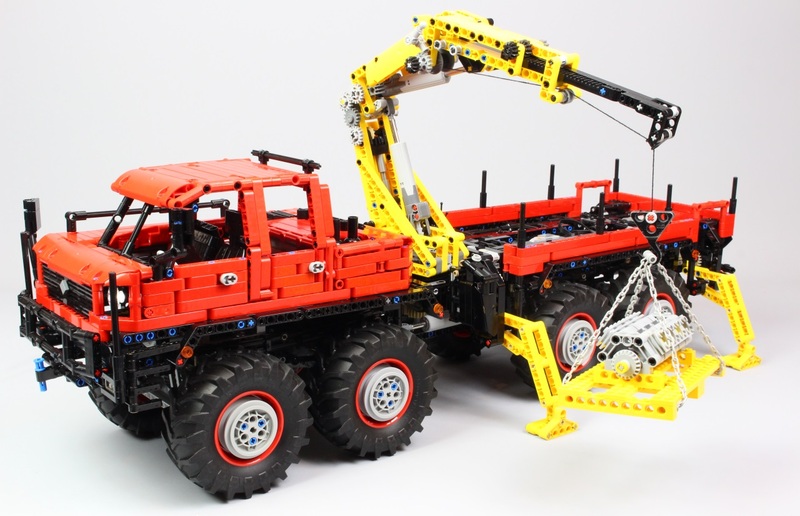 It’s one of the most impressively engineered creations of the year and there’s a whole lot more to see, including a video of it in action, at the Eurobricks discussion forum – click this link to check it out.